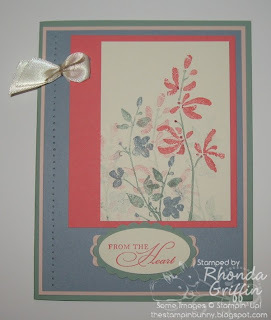 Even if you've never stamped before, consider joining me for a card-making charity event to benefit Ronald McDonald House Charities on June 26, 2010 at Braum’s on Edmond Road just West of Santa Fe. Drop in any time from 2:00 p.m.-4:00 p.m. We'll be in the separate dining area (that used to be a playplace). You'll pay $1 per person and make 3 cards. 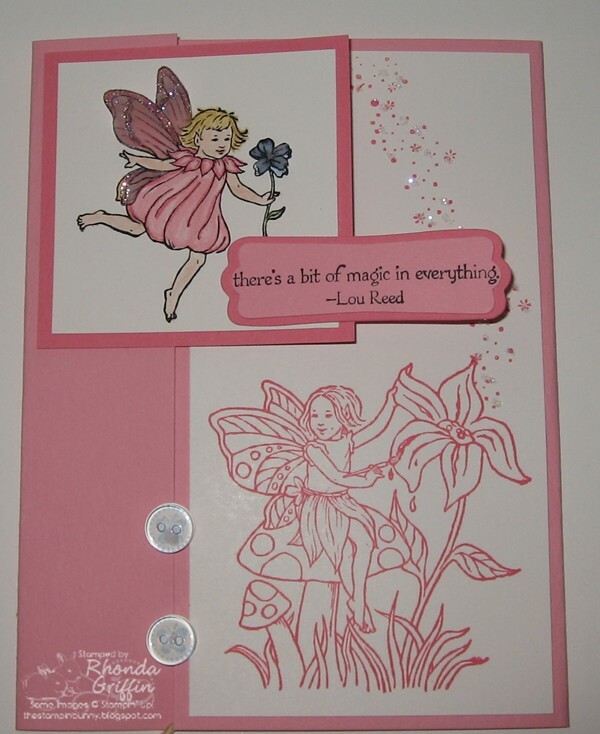 Two will be donated to the Oklahoma City Ronald McDonald House, and you may keep one card for yourself. 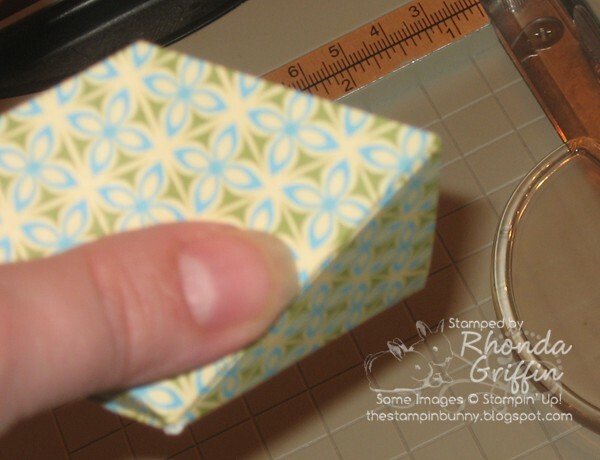 Please RSVP by June 24th, so that I may cut enough cardstock for everyone! This is the first batch of cards I have created and then, cut eight each. 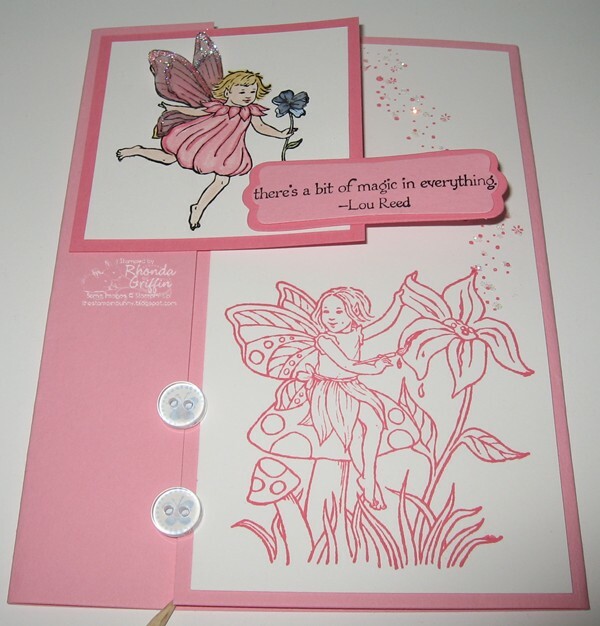 The cards you will create may be different to provide a nice variety of styles and sentiments for the Ronald McDonald House. Won't you join me for this fun and inexpensive event to provide cards to those staying in our local RMH? 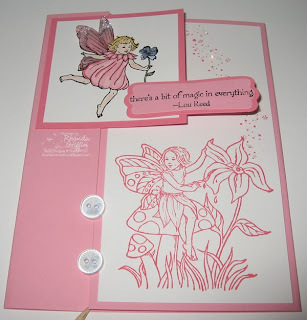 The A Little Big of Magic set will make adorable cards for little girls--My first card is really simple and includes Paper Tole just for the wings. 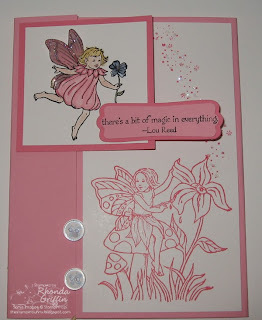 I stamped in Vellum, colored them pink, added glitter and attached them to the fairy's back with mini glue dot bits. Hopefully, you can see the wings better since I tilted the angle of this picture? 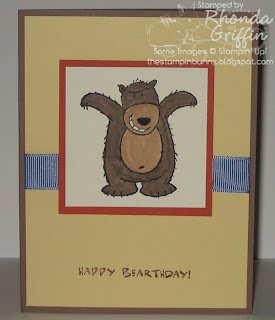 Today I used the MOJO140 sketch for this card using retiring cardstocks and paper tole. I used Stampin' Up! 's Asian Artistry hostess set and the hostess paper pack in Ruby Red and Mellow Moss with it as well. 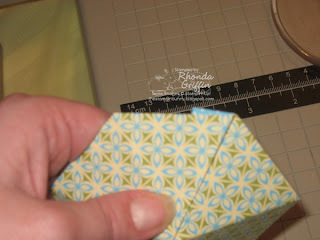 Paper Tole is today's technique challenge on Stampin' Addicts...I find it pretty easy to cut out some portions (I used different colors on some petals) and pop them up on dimensionals or half of a dimensional. Perhaps it is easier to see in the second picture. 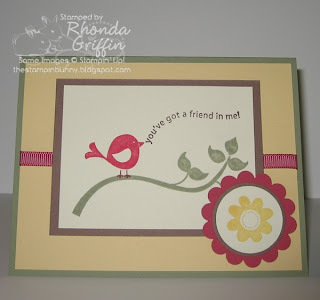 I hope you'll try this technique and upload to Stampin' Addicts. I'll have another example of Paper Tole tomorrow. 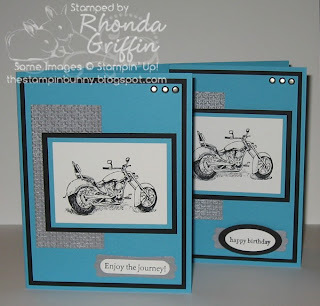 Okay, the men (or women :) ) closest to me don't ride motorcycles, so I didn't ~need~ this stamp from Stampin' Up! 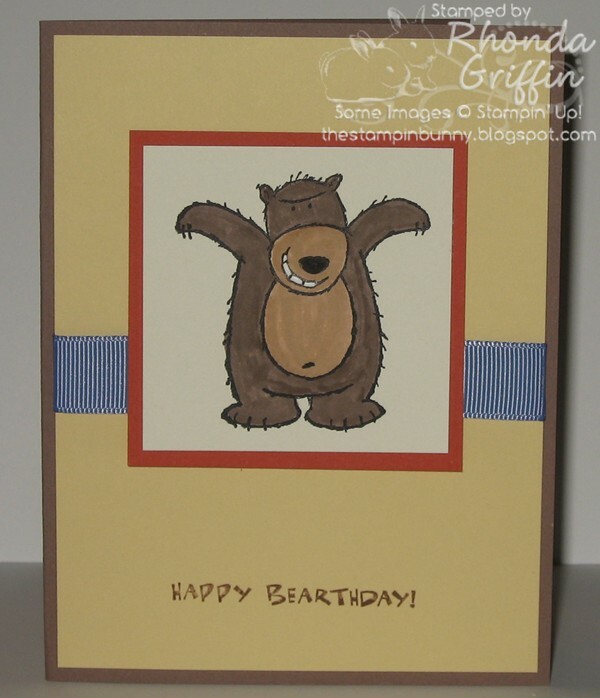 's new Summer Mini catalog, but it seems so practical for masculine birthdays and events. I obviously talked myself into it, and since it was only $8.95, I was easily swayed. 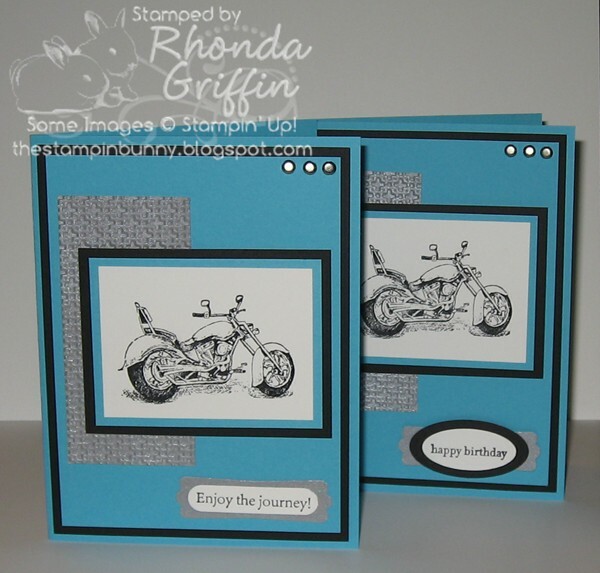 The sentiment from the Pedaling Past set, "Enjoy the journey!" makes this an "anytime" card. 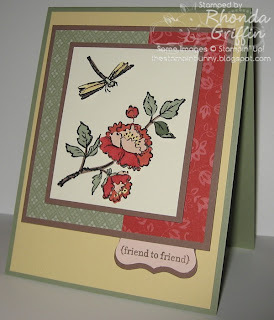 I used SASC52 on Stampin' Addicts for the sketch for this card, and I was inspired by this Graduation Card by Kay Kaltoff for the awesome use of SU! 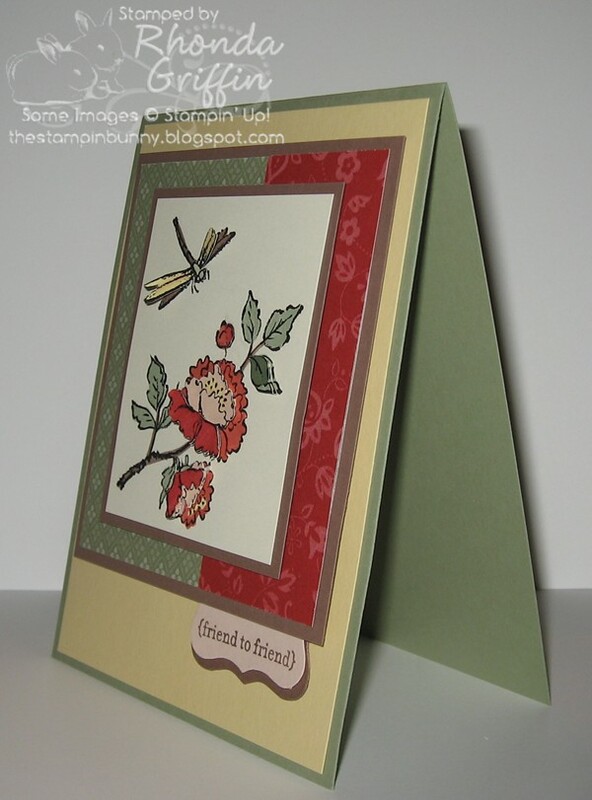 's new Square Lattice Embossing Folder. 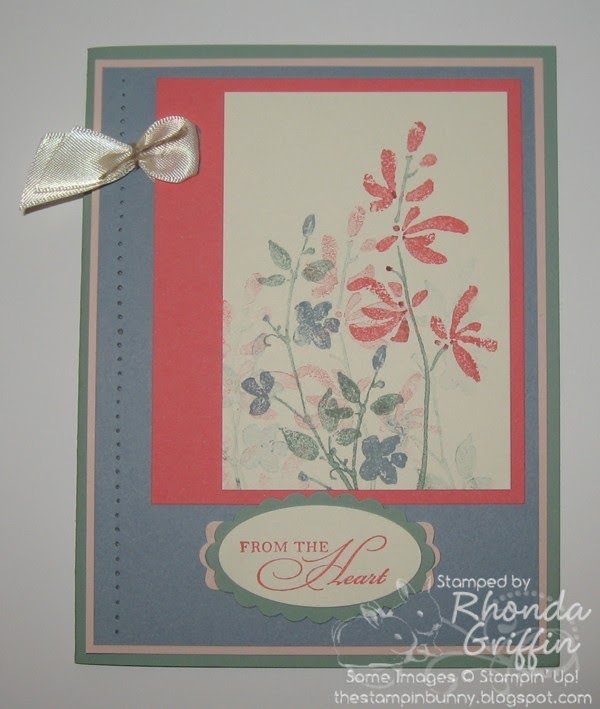 This card could be made in a variety of colors and is quick and easy! When the cat and dog sets were Sale-A-Bration choices this year, I was so pleased. 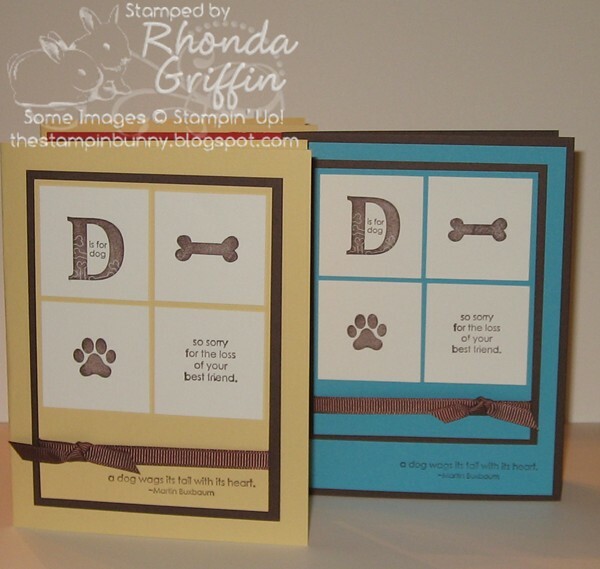 Occasionally I do need to send dog or cat sympathy cards to friends, so I promptly chose those sets for free. 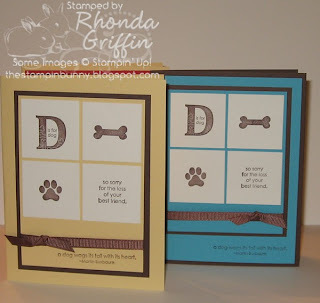 I made several of the dog sympathy cards...I find that having a good stock of a card usually prevents me needing to use it, so I'm protecting my friends' pets by making these-LOL! 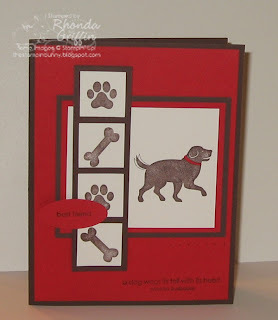 I also made a Congratulations on your new dog card with last week's MOJO Monday sketch (MOJO137). 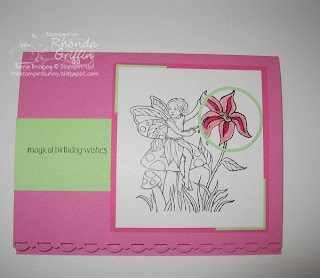 I think this sketch made the card SO much nicer than I would have imagined on my own. 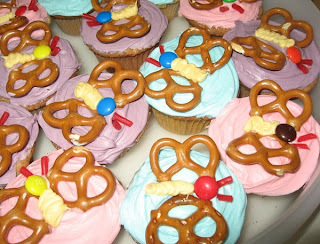 I also had to share these pretzel butterfly cupcakes. I found them elsewhere, but they credited the Martha Stewart website. Sara will enjoy taking these to her end of year dance class party today, and they were very stress-free even with Sara helping a bit. This is of the cards for Chicks and Chocolates Quick and Easy cards which will be on the 20th of this month at 9:30 a.m. or 6:30 p.m. I love Stampin' Up! 's new Watercolor Trio set! 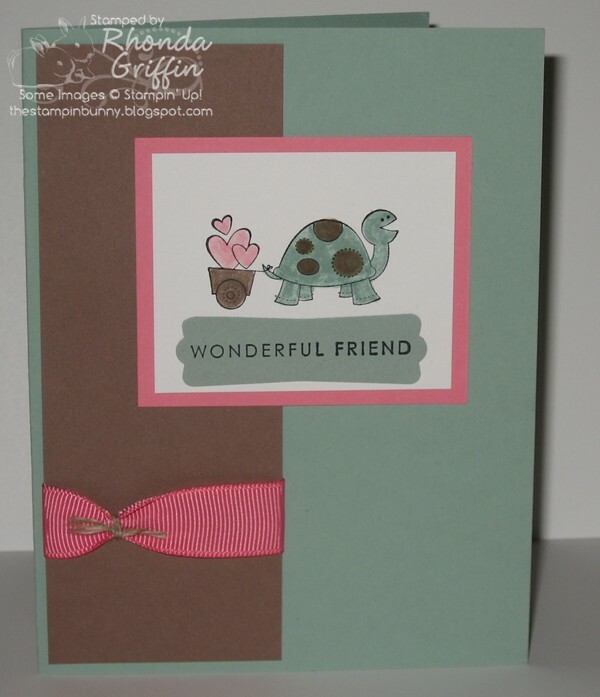 It is versatile, includes three sentiments and looks nice with these soft colors and other retiring colors as well. Get the retiring colors while supplies last. 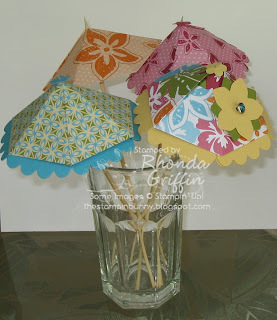 These umbrellas are easy, but do take a little time. I think you'll enjoy how easy they really are. If it seems confusing, it is probably the fault of my instructions. 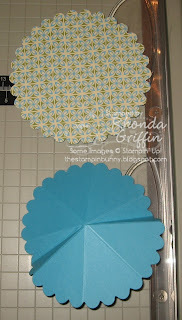 Maybe having a Scalloped Die Cut on hand while you're reading would make it pretty easy to imagine? 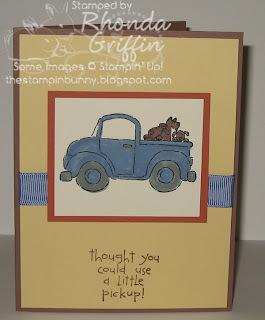 The first step is to score the Stampin' Up! Bigz Scalloped Circle every 4 scallops at the low point (meaning in the trough-not at the curve/peak of the scallop) in half evenly from top to bottom (or bottom to top-your call) At the end you will be left with only three scallops rather than four. 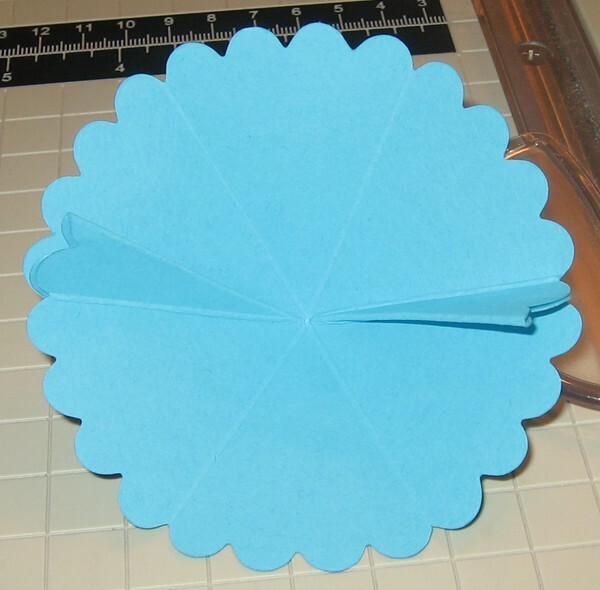 At the peak/curve of the middle of the three scallops, score again in the vertical direction. We'll call this the ~fold~ score. You can see this step in Tempting Turquoise below. Now just bump fold all the regular scores up and fold the ~fold~ score down. Next, add sticky strip to the inside of the valley/trough as shown below. To complete the umbrella, just use sticky strip to lay the fold down flat. This is the simplest way to make an umbrella. At this point, just poke a bamboo skewer into the point at the top and secure at the top or bottom with a mini glue dot. I cut my bamboo skewers shorter (I cut the flat end not the point.) using very sharp kitchen shears so that they would be at the right point at the top of the glass. To create a smaller or more masculine umbrella, it is pretty simple to cut off the scalloped edges. 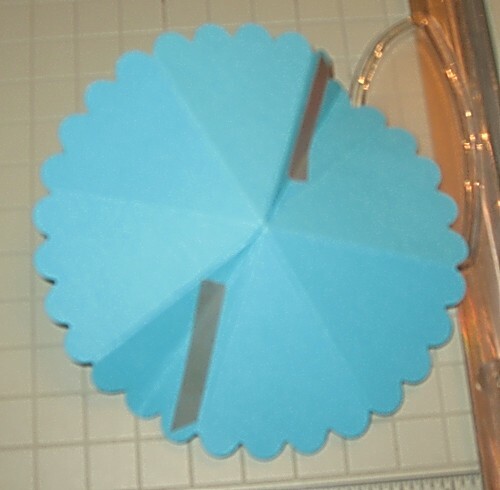 You proceed with the scoring as you did for the first umbrella, but don't use sticky strip yet. Line up the scored lines on your paper cutter and remove the four scallops as shown below. You do this the same way for the spot at which there is only three scallops too. 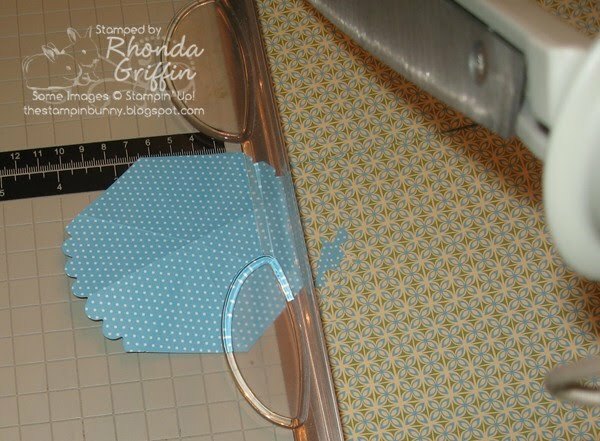 Next, fold the umbrella as you did the first one and follow the previous steps using Sticky Strip to adhere the flap down. Notice below that there is a bit of the underside showing. I just sheared that off with paper snips. 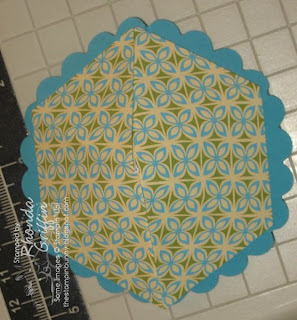 It is so simple to just place the umbrella without scallops onto the scalloped umbrella for the fancy version. :) At that point you just poke a bamboo skewer through each piece carefully and add a glue dot on each side (top and bottom) of the stick. You may want to adhere the umbrella layers together as well. I added a tiny flower on top for added decoration, but it isn't necessary. I'd love to see your umbrellas if you make some, so feel free to leave a comment with a link to your blog or gallery post. Have fun!